Or are you seeing 22, 222 or even number 2222 wherever you look? Does it show up on car license plates, restaurant bills or the clock on your phone, whenever you glance over!? Numerologists have known since ancient times that numbers are carriers of pure energy, containing a treasure trove of archetypal, spiritual wisdom. This is wisdom which crosses time and space and applies to all of humankind, and in our rapidly changing time, the information contained in Numerology is more urgent than ever. This explains why sightings of Angel Numbers have becoming much more widespread in recent years. Why are They Called Angel Numbers? Angels are the messengers of Spirit (or God, the Goddess, the Universe, whatever word you wish to use…) so when these number codes appear, they are actually sacred signs. Repeating number sequences like the number 222, or 11:11 are designed to catch your attention. They are actually intended to break the hold of the matrix, to draw your attention into the present and shift your conscious awareness away from the fakery of life as we’re led to believe it. Angel Numbers are like prayers from above, requests from the Divine for attention and intention. One of the first people to start publicly interpreting Angel Number meanings was Doreen Virtue, but once you know some basic numerology, you can do this too. (We’ll give you a free gift at the end of this article to get you started!) Many people even use number patterns as a method to connect with their Spirit guides and guardian angels on a regular basis … this is also something you can learn to do, too. What is the meaning of Angel Number 2? In numerology, the 2 is the first of the feminine numbers, holding the frequency of the mother archetype. It contains super-strong nurturing and sensitive energy and represents the need for collaboration, understanding, and harmony. At its core, this number can’t exist in isolation. Without the number 1 (the spark of new beginnings) the feminine is incomplete (and the 1, without the 2 is also radically imbalanced). So Angel Number 2 is all about walking a path of unity, of joining together and finding your life purpose through partnership. The Angelis message here, is that you need (and will hugely benefit) from the energy of others at this time in your life, so listen up! If you’re seeing the number 2 repeating around you, angels are also encouraging you to be sensitive, generous and giving you the nod, that it’s time to birth your gifts out into the world! Your hard work is paying off and it’s the right time! But the message buried deep within is to share, collaborate and open up to help and guidance from outside. The Number 2 also holds an incredibly potent vibrational frequency of intuition and insight. As one of the most psychically aware numbers, it often appears as a portal to divine messages and guidance from above so tune in! Trust your intuition and move slowly. Believe in yourself and your soul mission here, it’s very much needed. What is the meaning of Angel Number 22? In numerology, the number 22 is a Master Number and contains exceptional visionary qualities, as well as the practical, grounded impulse which comes from the number 4 (2 + 2 = 4). So when you see Angel Number 22, your Spirit Guides are encouraging you to lift your manifestational prowess up to the next level! 4 is also a traditionally “lucky number” associated with the Ascended Masters so the energetic support surrounding you at this time is positively supernatural! It can be a really scary thing to make your mark on the world. To take that first, brave step out of the box, away from the comfort zones of ordinary, everyday life and actually DO that thing that will make your heart sing! BUT, without birthing of your desire, intention, idea, or dream out into the world, the vibration of the master number 22 (known in numerology as the master builder) can’t be fulfilled! Your destiny risks diverting into realms OFF your path. So if this number is showing up for you, it’s time to release your intention, externalize it and start nurturing its existence in the big wide world. Angel Number 22 is here to tell you to make that phone call, write that email and take the inspired action that will shape your desire into being! Trust yourself, your instincts and the visions in your heart. Seeing Angel Number 22 is a truly powerful sign that it’s time to take your big idea and make it your reality! What is the meaning of Angel Number 222? If you’re seeing Angel Number 222, it’s time to sit up and take note – through the Archangels, the Universe is trying to get your attention! This is a powerful sign that you need to build and nurture your dreams! Angel Number 222 can often appear when doubts, anxiety and fears have begun to creep into your mind, and you’re avoiding doing the work you need to. So practice self-trust: believe in your intuition and your creative power, and you’ll become a catalyst for incredible change in the world. When you see the number 222, the angels are telling you to dig deep and call on the trust that resides within, because YOU are the one steering the ship, and nobody else can do the work that you are being called to do. The number 222 sure is a wake-up call, so don’t dismiss it. Combined, 222 form the number 6 (2 + 2 + 2 = 6) which is another highly creative and nurturing number, so take this as an angelic reminder to care deeply for yourself. Number 222 may also bring the message that it’s time to be your own nurturing mother and to cultivate and care for yourself and your desires as a priority. So if your focus is being pulled elsewhere and your energy is currently scattered, you are now being called to pull it all back into center. Your guardian anges are guiding and supporting you to do this, because only from this place of inner strength and poise, can you truly express your work out into the world. Seeing Angel Number 222 is a powerful sign of protection. You are cared for and you are loved, so have no fear: do the work you came here to do. 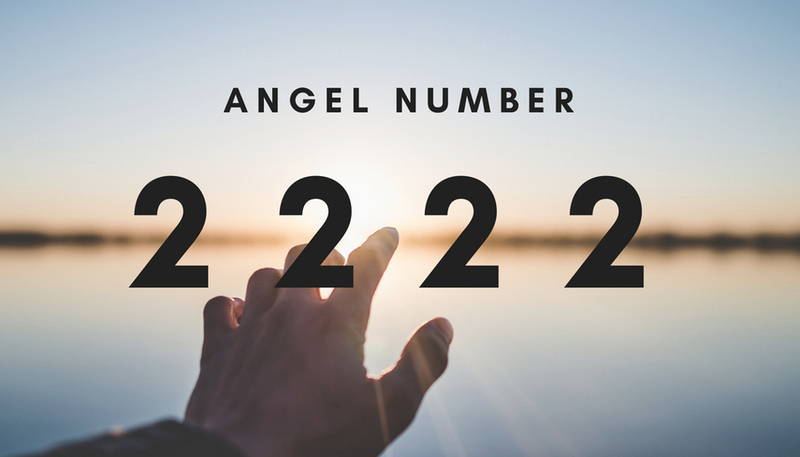 What is the meaning of Angel Number 2222? Seeing Angel Number 2222 is a very powerful spiritual omen. It’s a number that encourages balance and harmony, containing the energies of both the divine masculine and the divine feminine principles. If you’re seeing this angel number, you’re, you’re being given the message that you are on the right track so create with beauty and care, rather than force. Combined, 2222 reveals the frequency of the 8 (2 + 2 + 2 + 2 = 8) which is regarded as a number of immense power and wealth. You have this potential right now – miracles can be yours! – But your pathway must be through the sensitivity and cooperation of the 2. Trust your intuition, and keep going on the positive track you’re on. It’s the right one. Don’t be fearful of making your mark in the world because it’s only really through the actualization and manifested expression of our human journey, that we learn our soul lessons. We live in a world of duality and the number two echoes this, encouraging us to live it out. Your Guardian Angels want you to know that you are divinely supported right now. Remember that your creation is an extension of Mother Earth, so work in communion and collaboration with her. Seeing Angel Number 2222 is a powerful sign of encouragement and affirmation. You don’t need to know what the big picture holds, simply follow each step as it is revealed to you, and you’ll make a great contribution to the world. But What About Other Number Sequences? Are they just a coincidence? Or are they too significant in numerology … and beyond? Do you keep seeing Angel Numbers? Is the energy of the number 2 showing up in your life at the moment? Comment below – We would LOVE to hear the hidden messages that your guides are bringing to your attention at the moment!